When I was house hunting, I once walked into a house where the entire place smelled like a freshly baked cookie. It instantly made the house seem so much “homier” and more welcoming. And while we didn’t end up buying that house, the thought of walking into a room and having it smell so comforting was a lesson I took with me. It seems like Renuzit thinks the same way, with their new Renuzit Tempting Indulgences home fragrances collection capturing the scent of some of your favorite desserts – such as Red Velvet Cake, Crème Brulee, and Chocolate Covered Cherries. 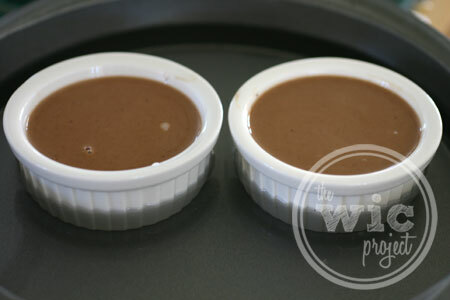 Inspired by these “tempting” fragrances, I decided to bake up some Chocolate Hazelnut Crème Brulee using a modified version of Paula Deen’s recipe. 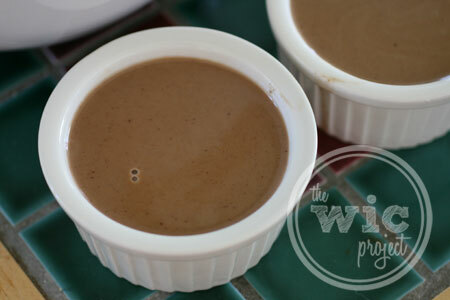 Gourmet Crème Brulee you can make at home! Place the egg yolks in a large stainless steel bowl. 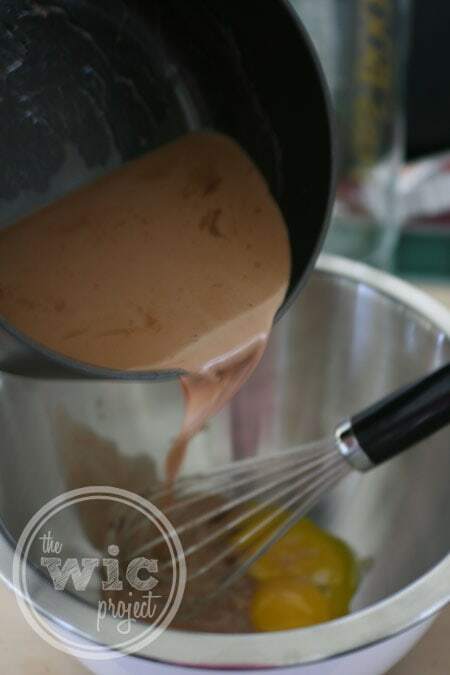 Slowly add the warm chocolate mixture to the eggs a little at a time while whisking. Strain and pour into individual porcelain ramekins. Bake until firm in the center, about 30 minutes. Remove the ramekins from the water bath and let cool completely. Place in the refrigerator for 2 hours. Dust with sugar and caramelize with a propane torch. Serve immediately. Allow an additional 2-3 hours for cooling. First, mix the cream, sugar, hazelnut liqueur (I used Frangelico – you can also use a chocolate liqueur like the original recipe for a more chocolate flavor), and the vanilla over medium-high heat. 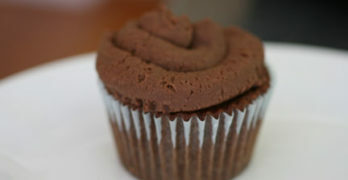 Once the mix is warm, add in the cocoa powder and unsweetened chocolate. This mix will smell AMAZING. It’s making the house smell good already. Then you’ll slowly whisk the mixture into the egg yolks. Then strain the mixture into your ramekins. Place the ramekins in a large pan with water and bake. Not only will your kitchen start to smell of delicious baking chocolate, but in a few short hours, you’ll be able to enjoy this delicious treat. After the crème brulee is chilled, top with sugar and use a propane torch to melt the sugar to a nice crust. Don’t have a propane torch? Me either. Just heat your oven to broil and place the ramekin a few inches under it to get that nice sugary crust. If you want your home to smell like you’re a gourmet baker, or just to add that extra bit of warmth that helps a home feel like home, you can pick up the new Renuzit Tempting Indulgences fragrance collection at your local Walmart or Safeway. 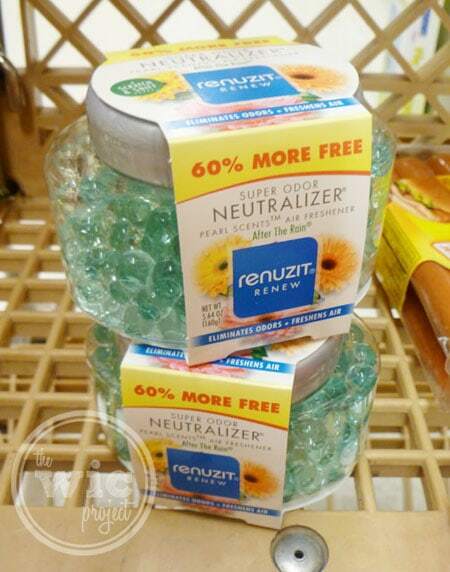 Make sure you grab this coupon to save on the Renuzit Tempting Indulgences collection. I browsed the air freshener aisle at the nearby Safeway in hopes of finding the new scents, but it looked like they were already sold out. Fortunately, they had a few other home fragrance options that would so the trick. 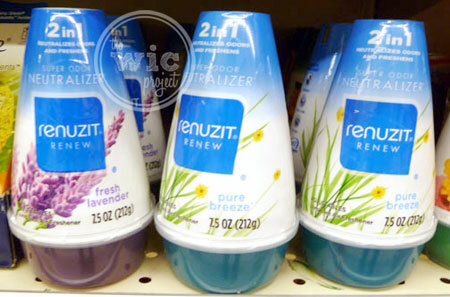 After a lot of sniffing we finally decided to pick up some of the Reznuit Renew Pearl Scent Air Fresheners. To view more pictures of our shopping trip as we picked up ingredients for our Renuzit Tempting Indulgences-inspired recipe, as well as the Renuzit options we found, check out our shopping album. Disclaimer: I am a member of the Collective Bias™ Social Fabric® Community. This content has been compensated as part of a social shopper insights study for Collective Bias™ and Renuzit #CBias #SocialFabric. This did not affect the outcome of this review. 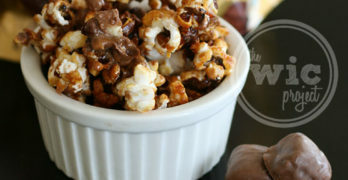 This looks amazing, I can’t wsit to try it. 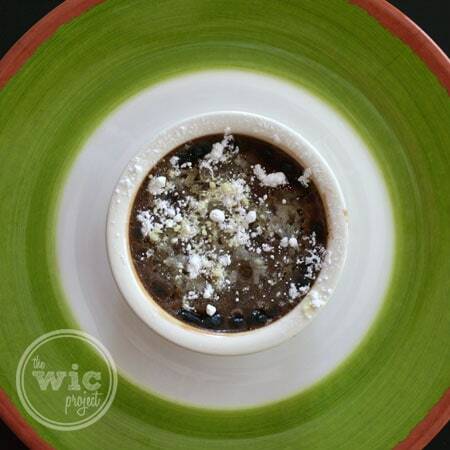 oooh…your creme brule recipe sounds so yummers!! i will have to try it! and the renuzit scent would just be a killer for me…i would just be watering at the mouth to have the real one!! !